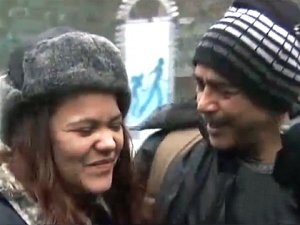 A homeless New York man has found the daughter he hadn't seen in 11 years - via Twitter. Daniel Morales, 58, had lost touch with Sarah Rivera, 27, and never knew he had grandchildren, reports CBS News correspondent Betty Nguyen. Now, Morales and Rivera have enjoyed an emotional reunion, and he got to meet her five kids - thanks to the social media website and an advocacy group that gave Morales a pre-paid cell phone and taught him how to tweet. Morales has been homeless since November, but had been trying for years to locate his daughter. She'd been trying to find him as well. They were separated in 2000 when she went to live with her mother, from whom Morales was estranged. They moved away, and he moved to Puerto Rico. Fast-forward to now: After Underheard in New York gave Morales the cell phones, and showed him Twitter, he took to it right away, tweeting in English and Spanish, and quickly amassing 3,000 followers. "Danny always said he wanted to tell his story," Underheard in New York's Rosemary Melchier told CBS News, "but he never thought anyone would listen to it, and I had said, 'Someone's out there. Someone will want to hear it.'" Three weeks later, Morales decided to try to find Rivera through his new avenue to the world - and succeeded. On Thursday, he tweeted, "Hi thi is to let yo people know that in lookin eoq my daughter her name is sarah m rivera". Someone anonymously contacted Rivera on Facebook to let her know her father was very much alive and hoped to reunite. One contact led to another, and finally, out of the blue, came a call to Morales from Rivera Thursday night. "We've got so much to say," Morales told his daughter. " ... I love you." The two spent all of Friday together. "It's a great moment," Rivera told reporters. "I feel rejoiced." "I'm happy," Rivera said. "I don't even know how to feel right now. I'm very, very happy." On "The Early Show on Saturday Morning," Morales told co-anchor Rebecca Jarvis he never thought his following would be "this big. ... People from all over are tweeting me back!" Reuniting with Rivera, he told Jarvis, "was something beautiful. Something big to me. Huge. I always had the feeling I was gonna find her some day. But I never thought it was gonna be like this. ... It's beautiful." Meeting his grandchildren, he said, was amazing. Too much for me. Beautiful. It's a feeling you cannot express." The most important thing for Morales now, he says, is to remain a part of the lives of his daughter and grandchildren. What would the one message he has for her be? "To be a good mother. A good daughter. And for her to know that I'm gonna be here for her for always.